Today, we are announcing the public preview of Azure Stream Analytics running on Azure IoT Edge. 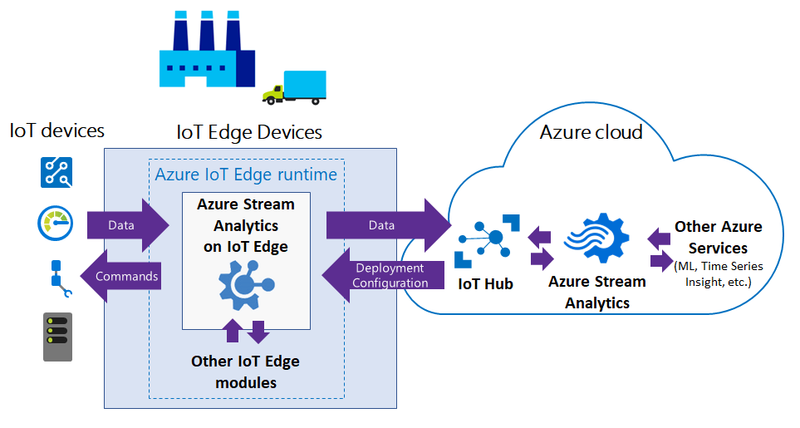 Azure Stream Analytics on IoT Edge empowers developers to deploy near-real-time analytical intelligence closer to IoT devices so that they can unlock the full value of device-generated data. Designed for customers requiring low latency, resiliency, efficient use of bandwidth and compliance, enterprises can now deploy control logic close to the industrial operations and complement Big Data analytics done in the cloud. Why put analytics closer to the data? Low-latency command and control: For example, manufacturing safety systems are required to respond to operational data with ultra-low latency. With ASA on IoT Edge, you can analyze sensor data in near real time and issue commands when you detect anomalies to stop a machine or trigger alerts. Limited connectivity to the cloud: Mission critical systems, such as remote mining equipment, connected vessels or offshore drilling, need to analyze and react to data even when cloud connectivity is intermittent. With ASA, your streaming logic runs independently of the network connectivity and you can choose what you send to the cloud for further processing or storage. Limited bandwidth: The volume of data produced by jet engines or connected cars can be so large that data must be filtered or pre-processed before sending it to the cloud. Using ASA, you can filter or aggregate the data that need to be sent to the cloud. Compliance: Regulatory compliance may require some data to be locally anonymized or aggregated before being sent to the cloud. With ASA, you can aggregate data coming from various sources, or in a given time window, for example. During the private preview of ASA on IoT Edge, we received positive feedback validating the use of ASA for these scenarios. Hiroyuki Ochiai, Director of the IT platform division for NEC Corporation said, “Azure Stream Analytics on IoT Edge increases the responsiveness of IoT solutions, while ensuring data privacy and sovereignty by processing data locally on IoT Edge. We see great potential to use this service across both our own IoT solutions, and those of our customers who benefit from NEC’s Azure Plus consultancy." With ASA on IoT Edge, you can easily use CEP for your IoT scenarios using the same interface and the same SQL-like language for both cloud and edge analytics jobs. This makes it easy to move analytics between edge and cloud. Our SQL language notably enables temporal-based joins, windowed aggregates, temporal filters, and other common operations such as aggregates, projections, and filters. You can find more information in our query language documentation. ASA on IoT Edge offers a cross-platform solution running on Docker containers that can be deployed on multiple platforms (Linux or Windows) and multiple architectures (Intel or ARM CPUs). This allows ASA to run on a large variety of devices, from small-footprint devices such as Raspberry Pi to industrial PCs, dedicated field gateways, or servers. By leveraging Azure IoT Edge to secure, deploy and manage your IoT solutions from the cloud, you can easily deploy Azure Stream Analytics to thousands of devices. ASA on IoT Edge preview is being deployed and will be enabled to all customers by Friday, November 17, 2017. 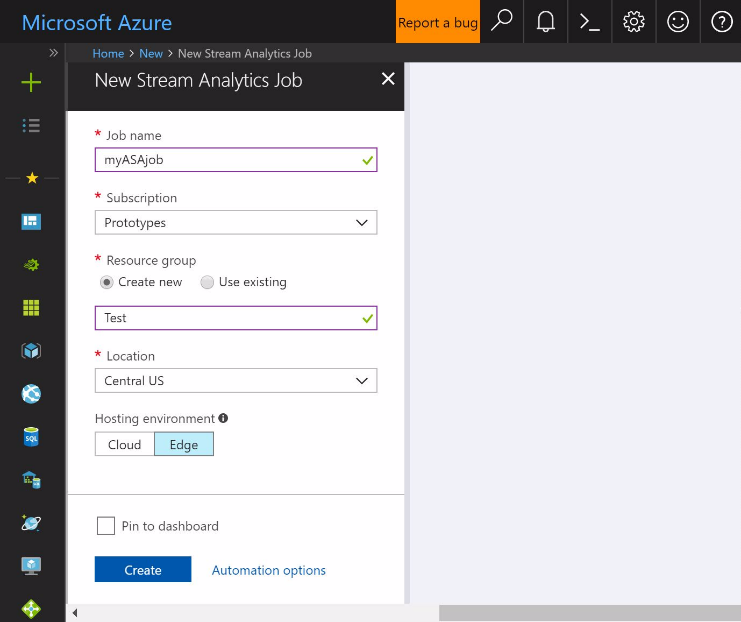 For more information, refer to the ASA on IoT Edge documentation, or go directly to the Azure portal to create a new ASA job and just select “Edge” as the hosting environment. An end-to-end tutorial is also available for a quick start.